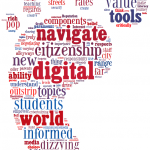 Welcome to our Digital Citizenship page. Digital citizenship is a belief and value system that aims to empower students to think critically and make informed choices about how we use the new tools to create, communicate and ultimately treat each other. The digital citizenship journey can be divided into eight components: Internet Safety, Cyberbullying, Privacy and Security, Digital Footprint and Reputation, Relationships and Communication, Self-Image and Identity, Information Literacy, Creative Credit and Copyright (commonsensemedia.org). Each component can stand separately or be easily grouped. The topics are woven together to form a foundational core value. In the language of Restitution, it would be “who is the person we want to be”. Our page FORMS provides links to our Guidelines for Using Social Media, and Student Guidelines for Using Social Media. These can be the starting points for conversation with students. Perhaps you need a visual reminder in your classroom? 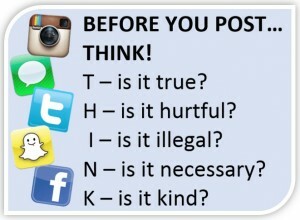 This “Before You Post, Think!” image may be just the thing you need.